This is Sara Kodesh. I wanted to interview her when I saw her adorable style. 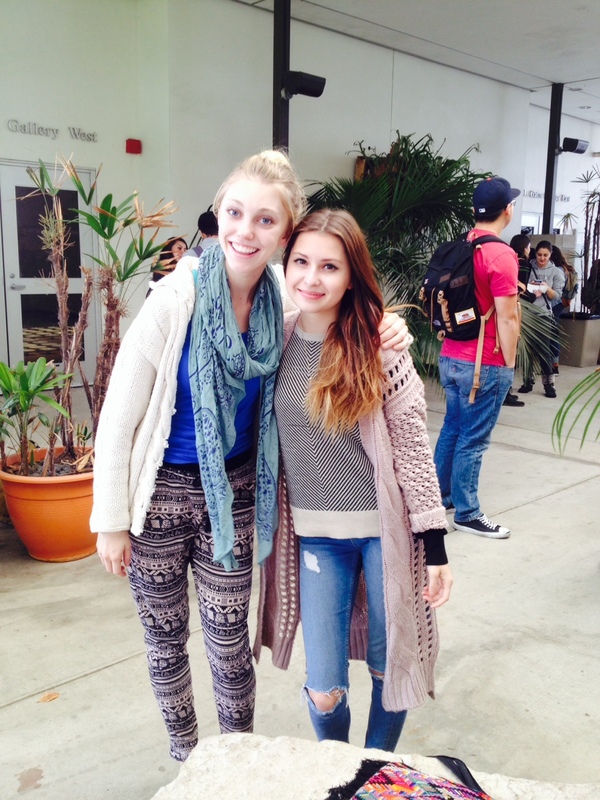 When we started talking I discovered that she was a junior here at CSULB and was a fashion merchandising major. Sara has always been interested in fashion and decided that when she graduated high school she wanted to go into the fashion world. She grew up with all boys and found that fashion was the perfect way for her to express herself. She loves the fashion department here at CSULB. One day she hopes to go into visual merchandising for a big company or small boutique. I learned that visual merchandising is the field that works with store layouts. It seems like a very creative job which was fascinating to me. Sara loves going to the beach and shopping. She is currently not in any clubs at CSULB because she is too busy. At the moment she is working at a bakery that sells wedding cakes. Her old job was at Nordstrom which she loved because it was the perfect fit to go along with her major. Unfortunately they over worked her and didn’t pay her well enough to survive though so she had to switch jobs to the bakery. We discussed animals for a big portion of our conversation. We both love them and want more pets. Currently Sara has a little dog named Louie and an older dog named Cookie who is a poodle. She used to have a cat, but sadly it ran away. It was fun to get to know yet another interesting student in our class! Posted in UncategorizedTagged #art110, fashion, Sara KodeshBookmark the permalink.